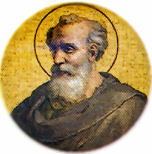 Eleuterus or Eleutherius, was pope from about 174 to 189 C.E., although his dates are uncertain. He was born in the Greek city Nicopolis. He is venerated as a saint in the Catholic Church, having fought against heresy and traditionally believed to have been involved in the conversion of the first Christian king of Britain. His name is Greek for "frank, honest, free-spirited." 2 Conversion of Lucius of Britain? According to his contemporary Hegesippus, Eleuterus was earlier a deacon of the Roman Church under Pope Anicetus (c. 154–164), and remained so under Pope Soter, the following pope, whom he succeeded in about 174. Even though the treatment of Christians under Emperor Marcus Aurelius was distressing in various parts of the Roman Empire, the persecution in Rome itself during this time does not seem to have been as violent as it was elsewhere. The prolific writer and Church Father Tertullian implies that it was Eleuterus who first condemned Montanism as a heresy. Other sources indicate that he issued an edict against Christians refusing to eat certain foods, probably aimed at Gnostic and Jewish Christians. The report that he supervised the conversion of the first Christian king in the British Isles may be more legendary than factual, but it won Eleuterus a lasting place of importance in Catholic tradition. Conversion of Lucius of Britain? The Liber Pontificalis also provides an remarkable assertion concerning the early missionary activity of the Roman Church. Eleuterus, says this writer, received from the British king Lucius a letter in which Lucius declared that he wished to become a Christian. Although the report is considered spurious by modern scholars, it became the source of several later stories concerning northern European kings named Lucius who converted to early Christianity. At the end of the second century the Roman administration was securely established in Britain, and it is indeed likely that local rulers could have been introduced to the Christian message by Roman officials who had privately adopted the faith. However, Catholic sources admit that it is unlikely that a tribal chief, known as king, should have applied to the Roman bishop for instruction in the Christian faith. The papacy was simply not established enough in this period to justify such a request. Critics suggest that the story, like some of the supposed edicts of Eleuterus against heresy, were intended by the writer of Liber Pontificalis to uplift the papacy, demonstrate the Roman origin of the British Church, and consequently affirm the latter's natural subjection to Rome. Another theory, provided by the great nineteenth century church historian Harnack suggests that the compiler of the Liber Pontificalis mistook the name Britio for Britanio. Britio (Britium) was the name of the fortress of Edessa, and thus the king in question would be Lucius Abgar IX of Edessa—full name Lucius Ælius Septimus Megas (Abgar IX)—who was indeed a Christian king of the late second and early third century. The ninth-century "Historia Brittonum" sees in "Lucius" a translation of the Celtic name Llever Maur (Great Light). It holds that the envoys of Lucius were named Fagan and Wervan, and tells us that not only Lucius but all the other British kings (reguli Britanniæ) were baptized (Hist. Brittonum, xviii) at this time. Thirteenth-century chronicles add other details. The Liber Landavensis, for example, gives the names of the envoys sent by Lucius to the pope as Elfan and Medwy. It reports that Lucius' dominions were located in Wales. An echo of this legend penetrated even to Switzerland. In a homily preached at Chur and preserved in an eighth- or ninth-century manuscript, Saint Timothy is represented as an apostle to Gaul. He thus came to Britain and baptized a king named Lucius, who became a missionary, went to Gaul, and finally settled at Chur, where he preached the gospel with great success. In this way Lucius, an early missionary of the Swiss district of Chur, became identified with the alleged British king of the Liber Pontificalis. The latter work is the authority for the statement that Pope Eleuterus died on May 24, and was buried on the Vatican Hill (in Vaticano) near the body of St. Peter. The traditional relics of Pope Saint Eleuterus are housed in the Church of Santa Susanna in Rome. 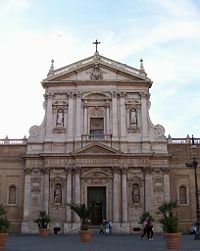 Later tradition holds that Eleuterus' body was eventually moved to the church of San Giovanni della Pigna, near the pantheon. In 1591, his remains were again moved to the church of Santa Susanna at the request of Camilla Peretti, the sister of Pope Sixtus V. Venerated in the western Church as a saint, his feast is celebrated on May 26. While his role in the establishment of the British church may be legendary, Eleuterus left a lasting impact on Catholic tradition in his treatment of heretics, especially the Montanists. At first unwilling to condemn them, he eventually felt compelled to stand against them. The Montanists presented a serious challenge to the authority of the emerging tradition of the monarchical episcopacy (rule over each church by a single bishop). Among the more specific problems relating to Montanist tradition was their enthusiasm for prophecy, their practice of speaking in tongues, their affirmation of women as leaders and teachers, and their insistence on strict standards of piety versus the Catholic tradition to embrace sinners through the emerging sacraments of penance and absolution. For better or worse, the papacy of Eleuterus marked a turning point in Christian tradition away from the the "priesthood of all believers" and doctrine of continuing revelation and toward a more institutionalized tradition centering on the bishops, with the bishop of Rome playing a key role. ↑ J.P. Kirsch, "Eleuterus. ", Catholic Encylopedia. Retrieved April 3, 2008. This page was last modified on 22 May 2015, at 20:01.